Popular Irony: Introducing The TFC! From the producers of Toddlers In Tiaras and the industry leaders in child exploitation television worldwide, Authentic Entertainment, comes the newest advance in sports broadcasting. 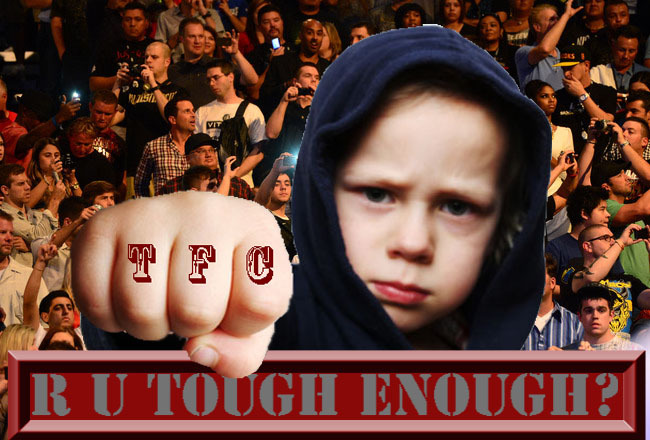 Ladies and gentlemen, introducing the TFC, the Toddler Fighting Championship! You the viewer have proven that you can't get enough of the sexualization of america's youth with the timeslot-leading ratings for the syndicated reality television beauty pageant extravaganza that is Toddlers In Tiaras, so now get ready to cut your teeth on the newest violent sensation to strike MMA, the TFC! Watch as the nation's most dangerous two-through-six year olds battle to bloody victory to prove their preschool yard dominance. The rules are familiar, but the faces are fresh and innocent. Victory comes by way of knockout, tapout, or ref stoppage, and all glory goes to the winner as we crown the first-ever TFC champion this Friday night at 9 eastern standard! In lieu of weight classes the fighters will be broken into categories by age, with the rattle division (2 and 3 yo), the sesame division (4 and 5 yo), and the heavy-hitting crayon division (6 yo)! SEE YOU ON FIGHT NIGHT!!!!!! !